A minute or two before the house lights went down and the world premiere of The Letter got underway, Paul Moravec tapped me on the shoulder. “Turn around and look,” he said. I was sitting in an aisle seat toward the front of the left side of the theater. 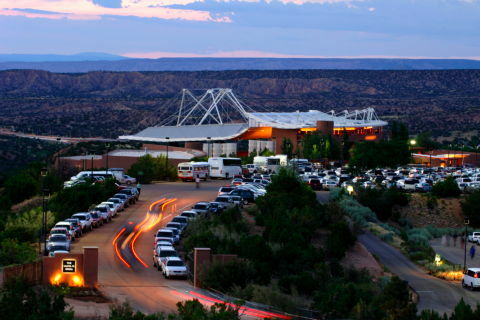 I turned around and saw that all two thousand of the seats in the Santa Fe Opera’s Crosby Theatre were full. Paul grinned. “Did you ever think you’d see anything like that?” he said. Mrs. T snapped a picture of the two uf us. Then we sat back down to watch the show. The first public performance of The Letter went even more smoothly than the last dress rehearsal. I know this because I watched it like a hawk. I was holding my wife’s hand from beginning to end, but she told me later that I never took my eyes off the stage. “It felt like you weren’t there at all,” she said. My ears registered the sound of laughter in unexpected and gratifying places, a sure sign that the audience was on top of the plot. Yet I couldn’t spare a glance for anyone around me, not even Hilary. All I wanted to see was the performance itself. I didn’t feel nervous–it was as though I were watching a show that someone else had written. Once or twice Paul reached back from the aisle seat in front of me and tapped me on the leg as if to say It works! Otherwise I was completely caught up in the action on stage. Ninety-five minutes after Pat Racette fired the six pistol shots that set The Letter in motion, the orchestra blasted out a climactic E-minor chord and the stage went black. A fraction of a second later, the audience burst into loud applause. I looked at my wife for the first time and kissed her. My brother and sister-in-law, who were seated to her left, said something I couldn’t quite hear. Then I saw Paul getting to his feet. The two of us had been told before the show to head for the stage door as soon as the performance was over, so I gave Hilary’s hand a squeeze, stood up, and started backstage. Just before I got to the door, I ran into Brad Woolbright, the Santa Fe Opera’s artistic administrator, a man who under ordinary circumstances is almost alarmingly cool and self-contained. His face was lit up like a Christmas tree. “They like it! It’s a hit!” he said, then hugged me. By the time I reached the wings, the entire production team was assembled and the curtain calls were underway. The sound of the audience out front was strangely muted. “Hey, Sullivan!” I said to Paul, clasping his arm. “Hey, Gilbert!” he said to me, looking as though he’d won two lotteries in a single day. I saw Jonathan Kent, the director, standing behind Paul. “What do we do now, Jonathan?” I shouted. He laughed. The stage manager told us that Jonathan, Hildegard Bechtler, Tom Ford, and Duane Schuler should line up and get ready to take a group curtain call, after which Paul and I would go on stage. I heard a surge of applause, glanced at the backstage TV monitor, and saw that Pat Racette was taking her bow. Patrick Summers, the conductor, followed her. Next came the production team. Paul and I stood in the wings, waiting for a signal from the assistant stage manager, who held her hand in the air to keep us from moving prematurely. After an agonizingly long pause, she dropped her hand. “O.K., composer, this is it,” I said to Paul, and we made our entrance. Once I got on stage, I looked to my left and saw the cast lined up, their faces glowing. I hugged Mika Shigematsu and Paul hugged Pat, whose hands I clasped tightly. I was about to start embracing the other cast members when I realized that the audience was still applauding. My God, I’ve got to take a bow right now! I thought, and stepped to center stage, standing to Paul’s left. I looked out at the audience and saw nothing but a bottomless pit of blackness. The stage lights were so bright that I couldn’t see beyond the edge of the orchestra pit. I knew that the audience was clapping, but I felt as though I were hearing them from under water. I sensed that Paul was bowing, so I did the same thing, bending almost double at the waist. Was that bow deep enough? I asked myself. Did it look all right? Paul and I bowed a second time. People in costumes surged up behind me and I heard a voice in the distance shout “Group call!” I put my right arm around Paul and my left arm around Patrick Summers. The entire cast and production team stepped forward and took two bows together, looking like a mismatched chorus line. Then the stage lights started to dim and we made our exit. The next few minutes are an impenetrable blur in my memory. All I know for sure is that Charles MacKay, the general director of the Santa Fe Opera, hugged me two or three times, and that Paul and I kept looking at one another as though we’d awakened from a dream. Suddenly the wings filled up with people, and I pulled myself together and started greeting friends, family members, company members, and excited strangers. Somebody shouted “Hilary’s here!” and I saw my wife, looking the same way she did on the day we got married. I took her in my arms, then glanced past her and saw my brother and sister-in-law. “That was cool!” Kathy said. Dave, my normally poker-faced brother, was smiling broadly beneath his neatly trimmed mustache. “Did they like it?” I asked my wife. “I didn’t even notice him,” she said. At length the backstage crowd started to thin out. Paul came up to me. “I guess we’d better head for the cast party,” he said. His face was flushed. “You da man!” he added. “You da man!” I replied. We passed through the stage door, and I saw with amazement that it was raining outside. Fifteen or twenty minutes later, Mrs. T and I arrived at the party. Joyce Idema, the head of the press department, greeted us at the door. “Are you happy?” she asked. “I didn’t know that,” I said. “I couldn’t see anything from the stage.” All at once I felt unsteady on my feet. Hilary and I spent the next hour or so exchanging hugs and congratulations with everyone in sight. Two phrases were repeated again and again: This show has legs. This show is going to travel. I thanked everyone as graciously as I could, but I was in a daze. I still felt as though I’d spent the whole evening watching a show written by somebody else. “Because of all the stress,” she said. “I think so,” I said. “I feel like I’m about to fall down.” We started making our slow way through the crowd, and a little while later we were on the way back to our rented condo. I drove very, very slowly, like a drunk who was afraid of running off the road, even though the only thing I’d had to drink was a few mouthfuls of champagne. “See how carefully I’m driving?” I said to Mrs. T as I pulled into our parking space.